The show is all set up, ready and waiting. I have a few more things to take care of. It is fair to say I am a nervous wreck, convinced I am going to forget something crucial. I know from past experience that once the event actually starts, I will enjoy myself, but for the next 27 hours I will be thinking, "Why did I get myself into this?" Nevertheless, my worst fear -- that no one will show up at all -- seems remote. Many thanks to my students for guaranteeing that I won't be standing in an empty gallery for three hours! June's suggestion: a sign clarifying the concept. Some people may not realize the mugs are for sale! One thing I didn't have to worry about was the mugs looking too diverse; turns out, no matter what I do, I don't stop being me. 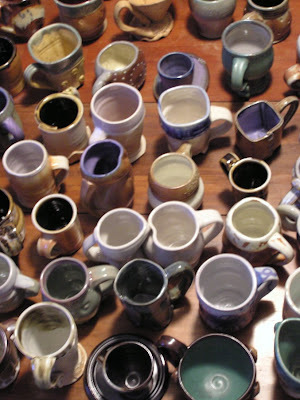 I'd love to upload photos of the 100 Mugs, which did, blessedly all get done within the 100-day timeframe. But I can't because my camera has not yet come home from its in-patient stay at Camera Hospital. I was organizind CDs (well, organizing is a strong work for what i was doing. I was actually just picking out the empty cases, and matching them up with the loose CDs) when I found a couple of discs of photos. I opened them to see what was there and found, among other things, my old booth shot. Makes me nostalgic, and it makes me want to take another look at doing art fairs again; how and if I could make that happen. That was fun. I may have discovered the real reason that I still have a part time job after all these years. I'm kind of embarrassed about it, but I am noticing that I don't want to do anything for eight hours a day...including make pots. Last December when I started this long reflection on my goals, business practices, and how the two can work together, I decided that I needed to make studio time a higher priority, in order to spend more time at it. I did that, and it worked, except for this small, uncomfortable detail: spending more than a couple hours in the studio per day makes it feel like a chore. Not what I had in mind. If I were the sort of potter whose things are finished when they come off the wheel, I could probably make enough pots in a couple of hours a day to live on, but I'm not. (I'm just talking wetwork days, here.) Everything is altered and decorated in some way. At the end of two hours, I might have eight finished pieces. Hmmm, let me do some math. Eight pieces a day, and not every day can be a wetwork day, so...thirty-two pieces a week. Let's say average retail is $30, half of that is materials, firing, and overhead...and say, two out of thirty-two won't make it due to cracking, accidents, glaze flaws, kiln kisses. 30 x 15 = $450. A week! Hey wait, I can live on that! Except that, I can't. I mean, I can certainly squeak by and be perfectly comfortable for now, but sooner or later I am going to need health insurance. Sooner or later I will be too old to work, and I should have money saved up against that day. Eventually I would like to pay down my credit card debt, instead of merely holding the line. What's the solution? Right now it's the IPTOG, which is looking less and less like an inconvenience. Long term, I don't know. 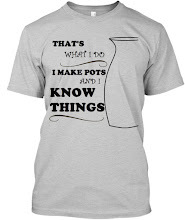 I don't want claywork to turn in to a grind, or what's the point? Maybe charge more? Maybe, but I am not selling so hot at my current price points. Still some thinking to be done. Many thanks to Natasha at Thursday Sweet Treat for including me on her Kreativ Blogger Award list. Natasha has created a supportive community of artists at her place, as well as the Sweet Treat themes. If you are joining me from TST, welcome! If not, check it out -- it's very inspiring. Scottish Lion and Friends Phyllis features the work of many different artists on her site. Here's one of my favorites. Blue Starr Gallery Linda always has something interesting going on. 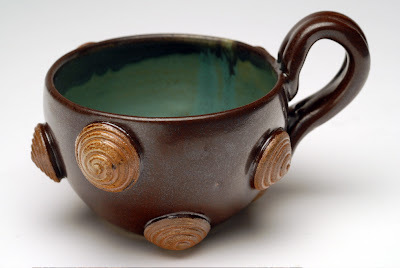 Support Your Local Potter Brandon Phillips blogs in a very personal and engaging style. Tispaquin's Revenge You never know what you'll get. Pinkkiss Pottery is a place I go when I want to be inspired. Tag, guys -- you're it! Can't wait to see which blogs you choose. I found two very useful tools that I wanted to share. Both are photo manipulation tools , along the lines of Photoshop, but have the advantage over Photoshop, in that they are free! My new-old iMac came with iPhoto, the standard package that Macintosh gives you when you purchase a computer. Like all comes-with software, it is barely adequate: I can crop a photo, or lighten/darken it, and that's about all. So I went in search of some better options. The first thing I found was GIMP, a free photo manipulation software to download. I wish I could personally vouch for GIMP, but I was not able to download it, because my version of Mac's operating system is too old. I've got 10.3.9, and I need 10.a million. Or something. But it sounds really cool, and it would be convenient to have to software. Convenient but not crucial, because the next thing I found was Picnik! Picnik is a website that allows you to upload photos, do your manipulation online, and then download them or export them to sites like Facebook and Flickr. I was able to create the strip collages at the top of this post using the free version. I like it so much that I, the world's cheapest human, am considering upgrading to the pro version, which costs $25 a year. The downside of Picnik is that it loads and responds quite slowly, but that may be just my elderly computer, the one which was deemed too stupid to handle GIMP. ..from Jay. I've only got time to post the one -- IPTOG today, you know. ...to be the largest Etsy seller ever. At least, side-to-side. I confess I recycled this joke from a comment on the Etsy forums, but it's so true! All this online promoting (previously known as "noodling around wasting time") has me sitting at my computer (ironically, on an exercise ball) so much I've probably put on five pounds in the last month. Too much of a good thing. I'd much rather post pictures of work in progress, or demonstrate how my new light box works, the one I haven't made yet. But my camera is having surgery, at some place I found on line. (Horrible thought: What if they just keep it? How would I ever get it back? But that's stupid.) So anything involving photography is out. Now seems like a good time to reflect on my progress in all that stuff I was thinking about near the end of last year. Make more stuff, which I hoped to accomplish by re-prioritizing, and putting studio work ahead of housework and errands. I have definitely done that, although I still find the dust bunnies, muddy paw prints, and unmade beds distracting. Boost my online marketing efforts, in order to utilize to my strengths, or, more accurately, turn a weakness into a strength. I may have gone overboard on this point. I am slightly obsessed with Etsy, and the other pieces of my online presence: Facebook, Twitter, Google Analytics, others. Twitter needs a post of its own, because although I am a grumpy old curmudgeon, and hate this newfangled, boring, pointless activity, marketing through Twitter has become something of a game. I have not seen a huge return in sales despite these efforts, but I am getting a bunch more page views, so that's how it starts, right? Get more consignment outlets. I have two new outlets for this summer season: The Artisan's Barn, in Readfield, Maine; and a new location in Bath, as yet unnamed, that my former business partner is opening. It seems to be the unfortunate nature of selling through consignment that one must continually replace outlets that fail, lose their lease, are the wrong venue, and so on. I'd love to rest on my laurels, but I need to get some laurels, first. Make six sculptural pieces so I can have a gallery show. This goal has been replaced by the 100 Mugs show, coming up in about three weeks. That has been a very motivating and inspiring project which is nearing its end: I need to think soon about what will replace it to keep my work fresh. This will be a more laid-back week than I have had in a while. The 100 mugs are all made and glazed, and awaiting firing, and my digital camera is off in California, or somewhere, so I can't even post new items to Etsy. And, as much as I'd like to be getting the garden ready for spring, it is predicted to rain until Sunday afternoon. It's pretty funny that I have to be forced by circumstance to relax! Fortunately I have a new book, some vase forms in my head, and a couple of blog ideas to work out. I came home to a $100 check. One of last summer's regulars finally drove by and noticed the pottery stand, bless her little heart. I took several of the 100 Mugs in to Jay York to be photographed. My own shots are fine for documentation, but for publication I needed to get serious. And yes, hubby Doug is a photographer, but he is more an art photographer than a photographer of art. If that makes sense. Turns out Jay and Doug are long lost buddies! My longtime student Holly Johnson now has a website! 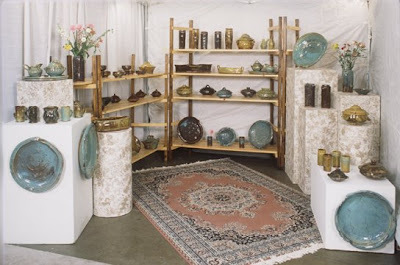 Visit Holly at Hurricane Mountain Pottery.